These words seem simple, but there are some grammatical differences between them! Take today’s lesson to find out how to use them all correctly. 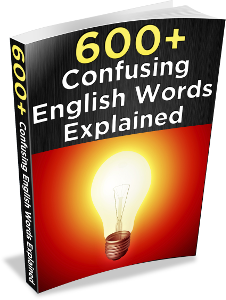 For more, check out my e-book on 600+ Confusing English Words Explained. Wait and await are both verbs, and they have essentially the same meaning – the difference is in their grammatical structures and formality. Await is more formal; in everyday English, it’s much more common to use wait. The soldiers are waiting for orders. We waited for the arrival of the products. Or: We waited for the products to arrive. Never use for after await. Wait can be used alone, with a time period, with to + verb, or with a person. These are all situations in which we can’t use await. The flight was delayed, so we had to wait for an hour. All those people are waiting to get into the nightclub. You’re late. I’ve been waiting for you since 9. The baby is asleep right now. When I came home, you were asleep on the couch. I was so embarrassed when I fell asleep in class. There was a lot on my mind last night, so it took me a while to fall asleep. My alarm clock wakes me up every morning. It’s time for Rachel to go to school; can you please wake her up? It’s possible to use wake without up, but it’s less common. I spoke quietly so I wouldn’t wake the children. I woke up early yesterday. I’ve woken up early every day this week. You can call me early in the morning. Don’t worry, I’ll be awake. He stayed awake during the entire overnight flight. We were all up past midnight last night. I let my kids stay up late on the weekends. After watching that horror movie, I was wide awake for hours! Note: Awake can also be a verb meaning the same thing as wake up (stop sleeping), and awake or awaken can be used for causing awareness/emotions, but these are less common in everyday speaking. You might see them in literature, though. I awoke from my nap at 2. Music can awaken deep feelings within us.